In Heaton, we rightly celebrate the footballing achievements of local polymath, Colin Campbell McKechnie Veitch, who won three championship medals with Newcastle United. But how many people know that Heaton was home to a contemporary, who also played for Newcastle (albeit briefly), was also capped by England, but who won FOUR championships. Some quiz question! William (‘Billy’) Hogg was born in Hendon, Sunderland on 29 May 1879 to Catherine Hogg, of Sherburn Co Durham and her husband, John, of South Church near Bishop Auckland, a fitter. But while William was still a young boy, the family moved to Newcastle and by 1887 were living in a newly built house on Spencer Street in Heaton. By 1891 the family comprised mother, Catherine, father John Father, still a fitter, 15 year old sister Elizabeth a ‘pupil school teacher’ , with William, aged 11, younger brother, John, aged nine and younger sister, Ann, eight, at school. The house was directly opposite the ground where Newcastle East End still played: they merged with Newcastle West End in 1892 and moved to St James Park. I wonder did young William see Alec White score seven goals in the club’s record 19-0 win in 1888? In any case, it was in Heaton that he received his football education. We know that William was soon playing organised football, first with nearby Walkergate Rangers, then Rosehill and later with Willington Athletic up the road in Howden. He was also a notable cricketer, once capturing a prize for taking seven wickets for no runs. His heart lay with football, however, and although he later revealed that his boyhood ambition was to play for United, he was soon spotted by football scouts from the town of his birth. 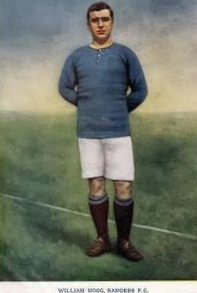 He signed professional in October 1899 and marked his debut with a goal in a 5-0 victory over Notts County. He went on to score six goals from outside right in his first season, in which Sunderland finished third. Billy married Martha Jane Smith in Newcastle in 1900 and, by 1901, was still working as a fitter (while also playing football) and living in Sunderland with his wife and young son. Robert. 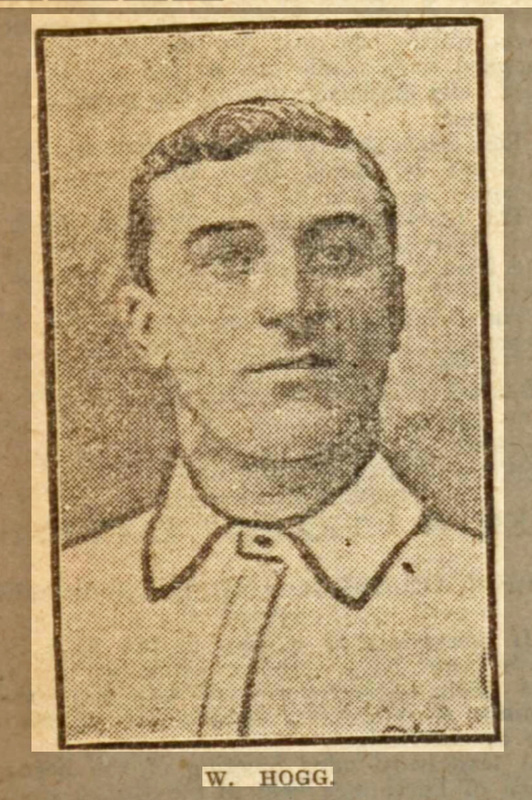 He was an ever-present in the 1900-01 season with nine goals, as Sunderland finished runners up (denied the title by failing to win at St James’ Park in their final game) and ten the following year when they were crowned champions, a year in which Colin Veitch’s Newcastle United were third and Middlesbrough promoted. Heady days for north east football! Hogg capped a brilliant year by being capped three times for England in the Home International Championships of that year. His second match v Scotland at Ibrox was marred by one of the biggest disasters in British football. 25 supporters were killed when, 51 minutes into the match, a newly-built stand collapsed following heavy rain. Remarkably the game was played to the finish but later declared void and the gate receipts of the replay at Villa Park, in which Billy also played, went to the disaster fund. Hogg also played for the Football League three times, in two of which he scored a hat-trick and he played for the North v the South. It was maybe some consolation to his erstwhile neighbours that Colin Veitch’s Newcastle soon beat Sunderland at home, then knocked them out of the cup and finished the season champions (with Sunderland third) but might also explain why Billy Hogg’s Heaton connection has been largely forgotten in these parts. in 1913 he moved to Dundee and the following year, he became player-manager at Raith Rovers. During WW1, it was reported that Billy Hogg had announced that he had returned to Heaton to work as a fitter and for the duration of the war, he would not play professional football only charity games. We know that in November 1915 and May 1918 he guested for Newcastle United and that, after the war, he returned to Scotland to play for Dundee, Hibs and Montrose before returning to Sunderland as a publican and then in 1927 a coach, a position he held for eight years. Billy died in Sunderland sadly prematurely on 30 January 1937, aged 57. Like Colin Veitch and Alec White, he deserves to be remembered in Heaton and beyond. If you can add to the story of Billy Hogg or of any other prominent footballer who was born, has lived or played in Heaton, we’d love to hear from you. You can leave a comment on this site (see the link just below the article title) or email, Chris Jackson, Secretary of Heaton History Group. This entry was posted in Research and tagged Alec White, Billy Hogg, Colin Veitch, cricket, football, Newcastle East End, Spencer Street, WW1 on October 5, 2015 by oldheaton.